A public house is described simply as any non-member bar where a person can enter as they please. Although pubs and taverns frequent street corners and strips malls in my birth city, Indianapolis, few establishments today carry the full name public house. Shoefly is one of them. When I crossed 22nd street approaching the restaurant, which opened in 2013 just north of Herron-Morton Place, my eyes fell upon their collection of picnic tables spaciously scattered inside a roped fence atop a freshly green lawn. There were no available tables outside. Historically, windows of town pubs were concealed by smoked or frosted glass to obscure clientele from folks on the street. But there has been a move towards clear glass and sun-filled interiors in recent years. Shoefly adopted this option. Our party of five: my roommate, boyfriend and his parents in town for the day, was greeted by a friendly server who informed a hostess would be right with us. With the warm spring air luring people to the outdoor seating, a large square table surrounded with benches and chairs against a brick wall was available to us immediately. No wait on a Saturday evening downtown? Not bad. As she delivered our drinks—a mix of Stone, Mikkellar and Bier brews—we discussed appetizers. Within seconds of entering the order into her mobile point of sale app, a food runner brought the veggie Sunchoke Chips and cilantro crema before Bridgett even left the table. Speed and efficiency were appreciated, but we agreed that the phone was a little distracting when it came to taking the entire table’s dinner order. What came out on our plates made up for it. The service was extraordinary. The food at Shoefly was first class. I ordered the Bison burger, medium rare, as recommended by Bridgett. It was tender, juicy and topped with the most delicious thick cut bacon I’ve ever tasted. I think the dish could have done without the bun, which added little flavor. An open-faced option, possibly with the pretzel flatbread, would better suit the dish in my opinion. The steelhead trout plate was fresh. It was seasoned and grilled well, properly served with the skin and paired with baby “dilled taters” and asparagus. The flatbreads were well-balanced and gorgeous in presentation, however, I was too full to eat more than just a bite. 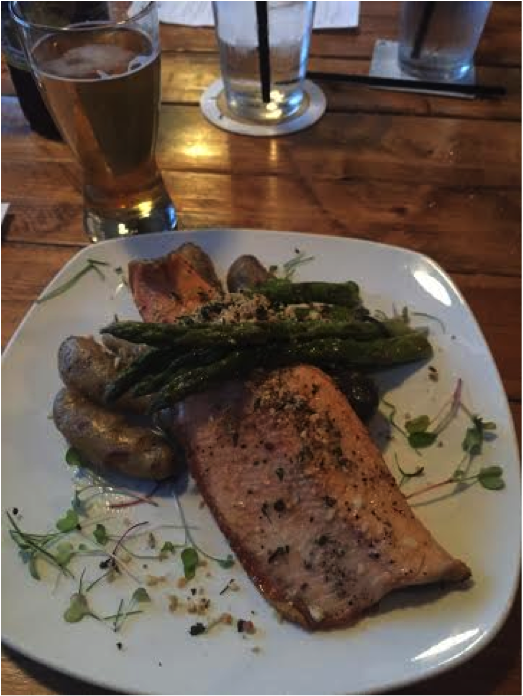 Steelhead Trout with baby ‘dilled taters’ and asparagus. Shoefly’s desserts are delectable. The Shoefly ”shoofly” pie, which owner Craig Murietto decided to provide when a friend told him his restaurant should serve the Pennsylvania Dutch molasses standard on the menu, is sticky and rich with a perfect hint of spice. It reminded my boyfriend’s father of his grandmother’s homemade cookies that no one has been able to replicate since her passing. This connection between food, memories and experiences are exactly what the public house stands for—just take a look at the dated family portraits on Shoefly’s walls. There’s no doubt that a bar situated on the northern border of Indianapolis Monthly’s next hottest hood won’t be around for a bit. Especially with young families, craft beer drinkers, the 26th best high school in the nation (Herron High School), and a 36 % increase in home equity in the last 6 years, Shoefly Public House is here to stay.